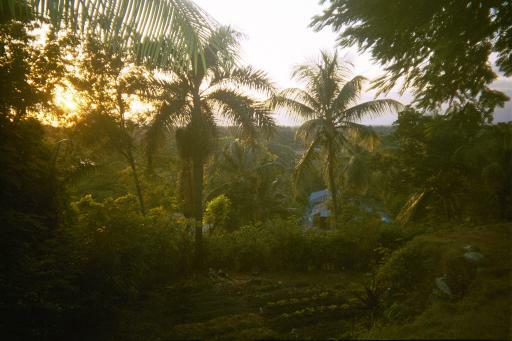 What follows is an account of my mission trip to our sister church in the village of Lievre, Haiti from Thursday, October 24 through Friday, November 1, 2002. I went with eleven others from Lakeline Church. This is our second such trip, and one we hope to repeat every year. taken while doing my devotional Saturday morning. 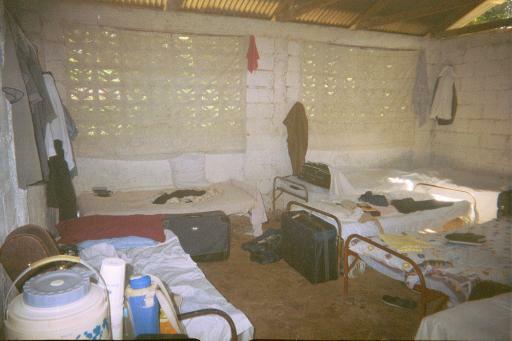 The purpose of the trip is not to "fix" the conditions in Haiti, to bring our American wealth to our sister church, or even really to "evangelize" the Haitians. There are many strong churches in southern Haiti, including our sister church, and they are doing a fine job of spreading the gospel within their own culture and in their own way. in obedience to God's call. Any Christian may be called to missions, and even those that aren't are to actively send others. Additionally, this year we purchased a gas-powered electric generator, and had it shipped down ahead of us. 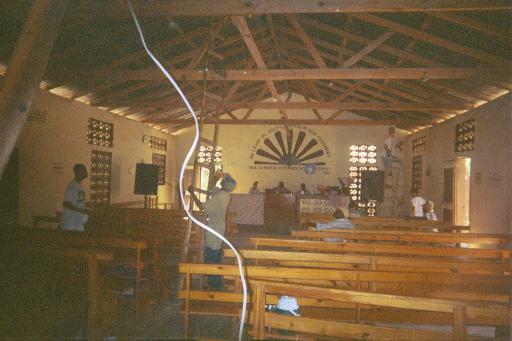 While there, we put in permanent wiring and lights in the church and the pastor's house. This will allow our sister church to hold services at night, which increases their influence in their village. Haiti is the poorest country in the Western hemisphere, with a per capita income of less than $400 yearly. And yes, food, clothing, gasoline, and other essentials cost about the same there as they do in the United States. Dan Shoemaker - head RMI guy in Haiti. Was born in Haiti of another career missionary, Herb Shoemaker. Wife is Debbie and two kids, Dawn & Devon. Billy Moses - lived in Dallas but in January of this year moved to Haiti with his wife (another Debbie) and daughters McKenna (4) and Savana (8) to be full-time missionaries. Seems to have been in a country band at one point. The text and photos below are excerpted from two and half rolls of film and twenty-four pages of journal I took during the trip. Some of the more personal or uninteresting details have been removed. You'll notice I tend to write in incomplete sentences. 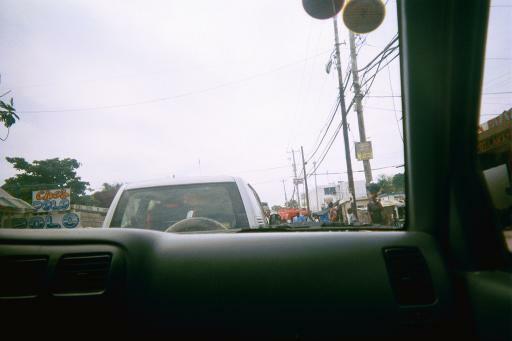 Driving through the streets of Port-au-Prince in one of the 3 RMI trucks, luggage in the back. We just stopped for gas and lunch at an Exxon station where I had a huge piece of chicken ("quarter", a leg and thigh). Prices are in Haitian dollars, which exchange at (as of today) roughly 6.5 per US dollar. You pay in gourds, which are 5 per Haitian dollar. My half-liter of water was $6.80, and V8 Splash was $10.40, and the quarter was $10. I'm quite full. We're headed to the retreat center. Brian was running late picking me up, so we got to the church a little late yesterday, but we got to the airport plenty early and without incident. Flight was fine, which a rushed connection in D/FW, then to Miami, FL, arriving a bit after midnight. We spent the night in the airport, and it was cold and I wanted a blanket and a decent pillow. I slept maybe 15 minutes all night, and others didn't sleep at all. We "got up" at maybe 5:30 to get downstairs to meet Herb Shoemaker. He treated us to a cafeteria-style breakfast, and I ate too much and took my Chloroquine for the week. Then through to the airplane, which was a monster with 8 seats per row and two aisles. I managed to sleep a little on the plane (half an hour). Haiti is beautiful from the air, green and mountainous. 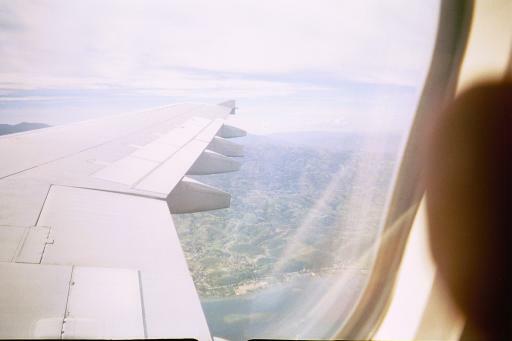 Once we landed, we walked to the airport, where we spent half an hour or so filling out paperwork for a Visa. The wait wasn't bad, as it was peaceful and quiet in the room at least. Then out to baggage claim, where Denise and Terra had already put all our stuff in a big pile. We got some carts at $1 each, and stacked up all our luggage. Then John Landwermeyer and I got to play body guard, trying to protect the bags from non-RMI "baggage handlers". Once we got out of the airport, there were several minutes of intense confusion as we tried to figure out who to trust. We got the bags into a locked, gated parking area and the RMI guys did some yelling to keep out some persistent others. Loaded up the vans, and we were on our way. Terra, Brian, and I are in one truck. Our driver is Samuel, who's only been with Dan a little while (4 days?) He's a father of 4, including a two-month old boy. He speaks some English, but mostly we're listening to the radio. Driving is crazy. Basically cars keep to the right and pedestrians don't get the right-of-way. Other than that, there doesn't seem to be much order. Cars pass on the left or right, and "he who hesitates is lost." Pedestrians will cross if it looks like its safe, and will sometimes hold up a hand to let you know they're coming in front of you. Roads were paved at some point, but lots of broken roads and potholes. A high percentage of vehicles are trucks with covered beds used for mass transit ("tap-taps"). Most use diesel, because it's cheaper (34 gourds/gallon), the repairs are easier, and the gas mileage is better. Lining the street (there seems to be only one) is a flea market of sorts, with almost everyone selling something off a cart/rack, out of their hands, or a basket on their head. Popular are little bags of "sweet water". School children have matching uniforms. 1:30 - Now we seem to be out of the city. The market is gone. The road is well-paved with a center stripe. We're going 50 MPH. Very few houses/lots of greenery. Mountainous jungle, palm trees. I guess you could call it "tropical". Since leaving the airport I've seen one white person not with our group. Okay, out for now. 8:00pm - Sitting on the porch working on VBS dramas for Monday. Around 6:00 we had an excellent meal of chicken noodle soup, fresh mangoes, fresh bread with butter (bur), guava jelly and peanut butter (mamba). I had a 7-Up out of a glass bottle. There were also cookies and cinnamon rolls. I managed to not overeat. Earlier today we rode, towns coming and going, with the roads progressively getting worse. We stopped to get some fresh mangoes and stopped at a little place to use the restroom. I slept for maybe ten minutes, and switched out of the front seat with Brian after the stop so I might be able to fall asleep better, but instead I just ended up getting carsick. We got to the retreat center at about 4:15 and unpacked. 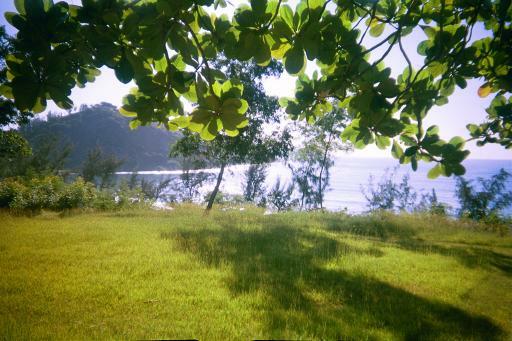 Most folks went to swim in the Caribbean Sea, where they encountered massive amounts of seaweed. I slept for maybe half an hour or forty minutes, which helped a lot. When I woke up I wasn't motion sick anymore and less tired. Dinner was at 6:00. Now we're done rehearsing and people are showering, journalling, sleeping, etc. I'm probably going to shower and go to sleep. Got to bed at 9:15 last night and fell asleep within half an hour. Woke up a couple of times during the night but slept pretty soundly overall. Got up around 7. Wonderful. Packed up and got dressed. Still using contacts. Breakfast was at 8:00. We sang "Jesus, Lover of My Soul". We had scrambled eggs with spicy sausage and onions in them, and toast and mangoes as last night (with butter, peanut butter and guava). Then I led a little worship set in the gazebo, people did quiet times and journalled, and we sat around and talked. Now we're packing up to leave at noon, and I'm going to go somewhere quiet and read my Bible (Psalm 19). 12:45 - Off to the village in Dan's red truck. Lunch at 11:45 was sandwiches (tuna or fried ham). 5:40 - Just had an excellent dinner. Goat (cabrit), which was a lot like pot roast, rice bean sauce, a root they call a "yam" which was a lot like a regular potato but a little drier, baked plantains and bottled coke or "fruit champagne" to drink. The drive up here was hilly and much slower. All the roads are unpaved and like "bumpy road" on Fisher Hollow and occasionally we had to cross river beds. We averaged 10 MPH. Lots of people on the side of the road and we waved and they would wave and smile. 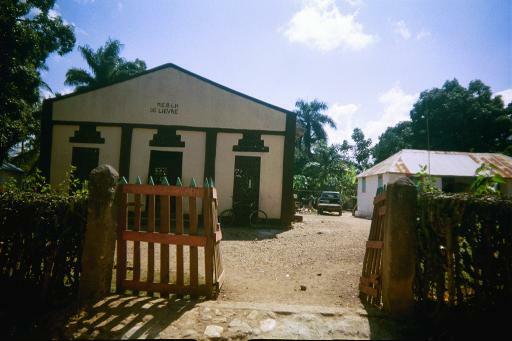 When we got to the village the whole church was out to meet us with signs that said "Welcome" and "Bien Venue". We got out and shook their hands and walked the rest of the way to the church. One girl (maybe 12) with no front teeth kissed me on the cheek (she was kissing everyone). 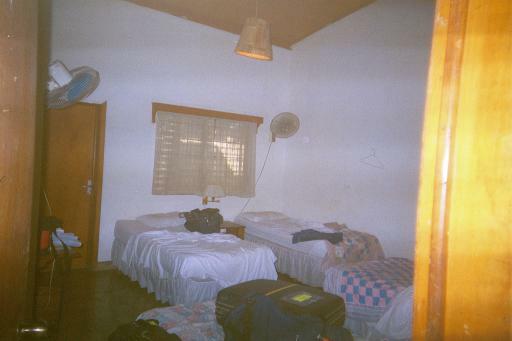 The accommodations are as good as many church camps I've stayed at. There wasn't a bed for me at first, so they dredged one up somewhere, so someone from the village is now sleeping on the floor, I think. Right now they are stringing lights and hope to turn on the generator. We're going to meet together again at 6:15. 8:30 - Generator works! Had a devotional time, prayer and some operating tips. Going to do "I Have Decided", "LILYNoH", "EMIM". Now we're just sitting around talking. Gonna sleep. Didn't sleep very well. The bed is lumpy and I was paranoid of bugs. I slept a couple of hours, anyway. Got up around 6:45 and took a "shower". Breakfast was around 7:30. We had hard-boiled eggs, bread with butter, some peanut butter I didn't try, and a honey-like spread made with guava, and bananas. I wasn't drinking all morning and felt sort of dehydrated by the time I finished breakfast, especially because I had half a cup of very intense coffee. The we had a devotional time with Dan at 9:00 and Billy led worship. Service started at 10:00 with announcements. Some congregational singing, some special music. Brian spoke on the fruit of the Spirit and did an excellent job. Then Pastor Jean spoke for a bit. Then we all introduced ourselves (one at a time) with sort of a Pauline greeting. I said, "I have no wife, and no children. It is just my church, my Lord and me. And it is enough." My verse was Zechariah 4:6: "Not by might, nor by power, but by my Spirit." Dan translated Brian's sermon and Antoine did pretty much everything else. We did "Mwen Te Deside" both ways, then at the end, "Lord I Lift". Service lasted until about 12:45. Kathy has been ill with a cold (probably contracted from the night in the Miami airport) and slept through most of the service in her room. Afterward we stood in front so they could shake our hands. 9:45 - About to go to sleep. Youth group didn't start until nearly 4:00. We sat with the Haitians. They did a few songs, then we taught them "Mwen Te Deside" in Creole and then again in English. Lauren and Kendall gave testimonies, and the Terra came up to speak (Antoine translating), and she was nervous but delivered a good message. At about 5 they started packing up the sound system for the outdoor service. We hung around until about 6 (when it was dark) and the walked down the road to the center of town. They'd set up some lights, the speakers and PA and were playing what sounded like Haitian Tejano. Lots of people were waiting around. All the Lakeline folks sat in chairs to the side and were mostly the center of attention. The Haitians had several songs which were good. Myself, N., and Tena gave testimonies, the we and the youth did "Mwen Te Deside" in Haitian. Then John gave his testimony and they did another song. The Brian spoke and gave an excellent sermon about putting your faith in Christ (including the excellent "wheelbarrow on the tightrope across Niagara Falls" analogy). It was fairly fire and brimstone. Then Pastor Jean came and gave a very Baptist invitation. One young man went forward and then much later another punkish-looking boy I'd been praying for (wearing a snazzy jacket and hat) went forward and then immediately went away. There was some confusion that he was just going up there to poke fun or for show, but apparently afterward he did it for real. And the pastor's daughter said he'd been a thief. Then we packed up and walked back. The stars are amazing. Then (around 8:30) dinner was served. 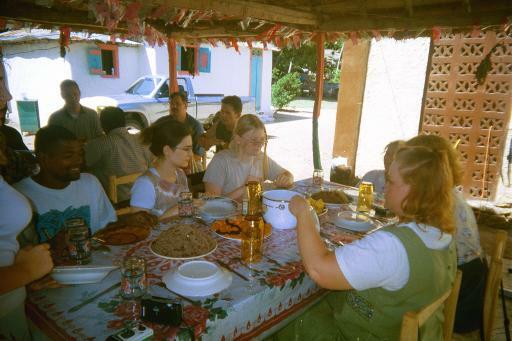 We had goat again, with fried potatoes, a cole-slaw type stuff, fried plantain cakes, and huge fresh avocados. There was also excellent cake and some alcoholic beverage (Dan said rum but it tasted like whiskey) in cream. We all had some, and I had a single "shot". After dinner we split up pretty quickly for bed, though Jerry, Brian, John and I stayed up until after 11:00 journalling and talking. I've been having allergies (runny nose) all day, so I just (11:05) took an antihistamine, so hopefully I'll be able to sleep well. I did sleep well, until 7:00 in fact; it was excellent. And today I haven't had any allergy symptoms, so looks like that medicine did the trick. It's raining as I write this (now stopped). Breakfast was spaghetti with franks(! ), which was very oily but good. VBS started at 9:00, and we had about 100+ kids. Started with music (Mwen Te Deside, LILYNoH, EMIM and Jesus Loves Me). Some of the older ones knew "Jesus Loves Me" in French, so we got them to sing it for us. I'd like to get them to write down the words for us for tomorrow. They sang it in B (I'd been playing it in D). The skits, craft (power necklaces), stories, puppets, density column (red Karo syrup = life without sin, yellowish corn oil = God, blue water (sin) separates us from God), and such were all well-received. They enjoyed me as John the Baptist, because I let my hair down, put on my blanket as a robe and used the shoulder strap from my messenger bag as a belt. The whole thing lasted right at two hours. We then hung around for a while and some of the guys started working on putting up permanent lights in the gazebo, church, and pastor's house. Not much else after lunch. Women's group is going on now (it started a bit before 4:00), and tonight we're meeting with the church elders. Mostly I've been hanging out talking to the ladies. N. and Kathy and I (and later Kendall and Lauren) had a good talk about marriage. And Kendall and I just hung out on the front porch talking for an hour or so. The rest of the guys were sleeping during that, and so now they're out doing electrical work. I'd be helping them, but they have more workers than tools, and I may have the least expertise of the group. I braved the facilities for the first time. They're not as bad as they look, but I don't think I'm doing it right. I'm going to need a better strategy next time. (Sounds like women's group is over (4:38)). I got a "shower" after lunch and before talking to the ladies. Not only was the water warmer in the middle of the day, but I was warmer so it felt good anyway. Denise woke up this morning feeling like she had something in her left eye. So she took out her contact and something wasn't right. Every time she moved that eye, it hurt ("like sandpaper"). It began to swell and even get some pus in it. Tena washed it out several times and put a patch over it, but by the afternoon it wasn't getting any better. So we prayed over her and Jules took her to Cayes to see the eye doctor. It's a few hours one way, and she's going to just stay at the missionary compound after that, so we won't see her until Wednesday or Thursday. And speaking of contacts, I haven't put mine in all day. It's been fine. I don't need long distance vision here. I guess I won't be able to see the stars as well, though. I'm going to see what the guys are up to. Time to get dressed again. (4:45) (By the way, the women's group is still going; I was mistaken.) And did I mention the church had been praying for no rain so we could get here over land that would be impassable otherwise. So even though it's the rainy season it hasn't rained in weeks. And Pastor Philistin says his "contract with God" is for no rain until we leave. At which point he's sure it will begin raining the day after we leave. Oh, and I successfully changed the film in my "non-user-serviceable" Walgreen's free film camera while we were waiting on lunch. I hope this roll turns out. 6:15 - Meeting with the elders. Jeremiah 32:14 - God is a God of planning. Psalm 23 - We don't repeat this in order to repeat David's experience. We should experience it for ourselves. God provides for our needs, but sometimes he only partially provides for them. We must be content with what God has provided. Thus he doesn't provide all we need all at once, lest we be like the prodigal son and say, "Now I no longer need God." Haitians know their land is despised = Pastor Philistin's prayer. It is only people who are in the gospel that can be blessed like this. When I see the clouds, I say to God, "Remember we are under them!" Brian says we (Lakeline Church) are being pruned. Trees which bear fruit are pruned so they can bear more fruit. We traded requests. Jerry gave them an inflatable globe, talked to them about the 10/40 window and asked them to pray about his trip to Bihar, India in April for three weeks, and again with one other person seven or eight months later. Pastor Jean recommends Psalm 20 - God will accomplish all our desires. Over at 8:30. Off to eat. 9:20 - Dinner was a cinnamony banana "shake" with bread you were supposed to dip in it. Time for sleep. What's Paul's philosophy of life? He tells us in Philippians 1:21. Paul wanted to die because he had an eternal perspective. Yet to live (and be *fruitful*) was more necessary for their sake. Paul further describes the norm for Christian living in Romans 12:1-2 (quoted for us by Kendall). We are not all called to missions, bot do I know that I'm not? What has He called me to? Do I know that? We are not all called to missions, but we are all called to sacrifice. Galatians 6:14 - Paul boasts in nothing but the cross. He is proud of nothing but that. Am I? Hebrews 11:24-26 - Moses refused to wear the mantle of Egyptian royalty, preferring the disgrace of following God, for hope of the future reward. Matthew 10:22 - How many hate me on account of God's name? Philippians 1:29-30 - suffering has been planned for us. Retirement is never mentioned in Scripture. Enduring to the end is. 2:10 - Breakfast was scrambled eggs, some round white bread (much like an English muffin in size and shape but like normal white bread in its texture and flavor) with peanut butter, butter and "guava jelly", which it turns out is mostly corn syrup with a little guava in it. Also bananas and some papaya. Our table thought the papaya had gone bad somehow, and it certainly tasted funny. Lunch (at about 12:30) was goat stew again, beans and rice, yams, plantains, and some orange round root thing I didn't get the name of but which was starchy. Oh, and carrots and beets as before, and fresh oranges. Got some goat fat in my teeth and had to floss for it. After lunch I took a shower and really got it figured out. First I put the large bowl on the stand and dumped several buckets-full of water on my head to wet my hair, with the runoff going back into the "clean" water bowl. 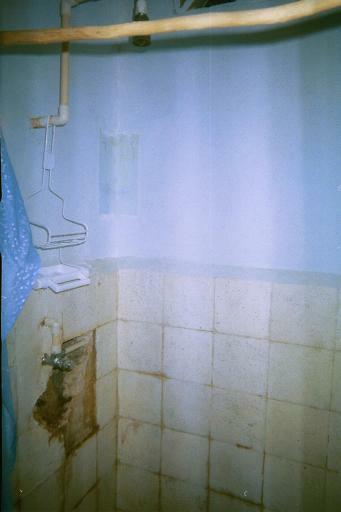 Then I filled the bucket with water and lathered my hair elsewhere in the stall, using additional water from the bucket as necessary to get the lather going or rinse my hands without contaminating the big bowl. 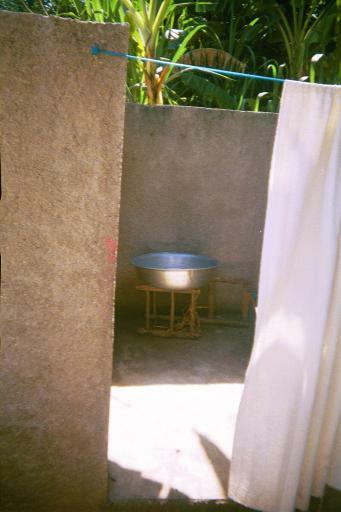 Then I lost a few buckets of clean water to rinse my hair, with the overflow just washing down the "drain". Then I sat the large bowl on the floor and stood in it, and used several buckets to wet myself, again catching as much water back in the bowl as I could. I then put it back up on the stand and filled the bucket again, soaping up and using the clean water in the bucket as necessary. Finally I used the remaining clean water in the big bowl to rinse. It wasn't much trouble, and I felt thoroughly clean afterward. Then I braved the restroom again. This time I tried a different stall, which looked much dirtier but was actually better. This time I had no problems. Mission accomplished. For VBS this morning I got one of the kids to show me the French version of "Jesus Loves Me". I sang LILYNoH first, since the kids had the least engagement for it, the followed it with "Mwen Te Deside" (a big hit; in fact, Billy's going to try to teach it to other mission groups) and then the French "Jesus Loves Me", which they like well enough but didn't sing as loud as the previous song. All the Bible stories ended up dragging a lot and the kids were losing interest, so Kathy (who's feeling better) had us shorten them *way* down (like a minute apiece) and the kids were a lot more engaged. Brian did a good job playing "Simon Di" (Simon Says) with the kids. At the end, Pastor Jean gave a long altar call, and five boys came forward, the fifth being one of the kids we are sponsoring for school! So that's awesome. Otherwise so far a lazy day. Men's Bible study pretty soon, then the "bye-bye" service tonight. We leave the village in the morning. The Bible says something strange about fear. Psalms 111:10, 112:1, Proverbs 1:7, 9:10-11. It says we fight fear with fear. Men pretend not to fear. But many Bible stories are about fearful men. In America, we fear loss of control over material things, loss of control over our health, loss of control over our relationships, and we have a fear of intimacy or singleness. We also have Spiritual fears - that of loss of Divine Protection. But fear of God is saying "Yes Lord, my fear of You is greater than all else." The Bible says "fear God" fifty-two times, and "fear not" more than any other command. The Bible is clear we are to fear God and nothing else. I Samuel 15:1-34. Fear causes loss of opportunity. God made it clear Saul was to utterly destroy the Amalekites. He was unwilling to destroy the best of the livestock, because he was afraid of the people (24). He blamed it on the troops (15), and then claimed that he hadn't been disobedient at all. But in succumbing to his fear of men more than of God, he lost the opportunity to be God's anointed, maybe even be the line of the messiah. Fear of singleness may push us into not waiting for God's best for our life. What do I fear more than God? What is there that I can't give to God? Answer this, and I'll know what I fear, and I'll know my master. Mark 4:35-40 Fear causes loss of control. The disciples, buffeted by the wind and waves, felt out of control. They then assumed God didn't care. We often equate our losing control with God losing control. In vs 41, finally their fear of God overshadowed their fear of the wind. Who do I trust when life gets out of control? God or myself? Why am I afraid? Isn't it because I'm trying to stay in control? I Samuel 17:1-58 David vs. Goliath. Fear causes loss of perspective. Goliath defied the Israelites as servants of Saul (8), belying his human perspective. But David saw things from God's perspective. (26,36,37,45-47) This story is now part of David's legacy. Our faith is of great worth to God. We will face trials and are called to sacrifice. And when we respond to the call of God in our present, we recognize the work of God in our past. We gain eternal perspective. Pastor Jean speaking - If you have a plan, and it is God's will, even if it seems difficult, you may proceed without fear. 5:45 - wrapped up. Off to eat, I think. 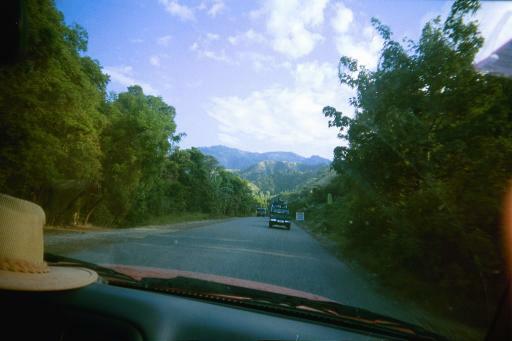 Just FYI, Haiti is still beautiful. This shot is from Dan's backyard. We'll be there tomorrow. 6:35 - Dinner was spicy coleslaw, goat, fried plantain and something else fried, yellow and round, and French fries. Also some excellent grapefruit juice with fruit I helped pick earlier this afternoon. (Ezekiel (I think that's who it was) would hit the fruit in the tree with a long stick and catch them with his free hand. He left the ones he dropped that fell into muddy water. Then he put them into a bowl. I helped with that last part.) Now in the bye-bye service. They're doing congregational hymns. Some of the tunes I know, but I'm so rusty on my hymns that I can't always place them. Read Psalm 103. Now special musics - Youth group first. It strikes me that all their harmonies are relative. They just start on whatever pitch feels right and everything goes from there. The song leader will usually sing the first line, in key but faster to give them a starting pitch. Also, the leader will call out - in rhythm and harmony - what the next verse is at the end of the last phrase of a verse. Cool idea, and a distinctive "Graceland" sound for a very practical thing. An exhortation from Pastor Jean. The love of God brought us (the missionaries) here. Jerry - It is answer to prayer to be here. We are all brothers and sisters. Brian - We leave a piece of our heart here. Pray for us. Billy - something in Creole. He misspoke some, so they laughed while he was speaking, but they clapped a lot when he was done. Song by us: Every Move I Make. They liked the "na"s, and eventually started clapping along (following Dan's prompting). Youth song #2. On the up everyone sang "When We All Get To Heaven" (in Creole, of course) and it was pitched very high. Rich harmony on their song. Little girls (5-12), some of them sponsored children, do a song. There's a little pitch drift (up), maybe intentional between verses. All in unison. "Why is there always division? Why don't you help your brother? Why don't you be reconciled?" A "little speech" by a church member (Ezekiel's brother?). We leave them in sorrow. In the name of the members of the church, as we look at the lights on the ceiling, God has done a special work here. To those here, if you don't have Jesus, come now. Because we in the church didn't know any of them, but they came and did this for us! Thanks for sponsoring kids, may God bless you in return. Bless RMI, safe travel for us. May this "melting together" continue until Christ's return. You have the same choice. Serve the gods of tradition, voodoo, dead Catholicism, or the Lord, the One True God. If the fear of voodoo still has a hold on you, you need to turn you back on them. Pastor Philistin is a great man and a strong leader - he (Brian) knows this because unlike many churches, which have only women and young children, this church is full of godly men. Exhorting the youth to forsake the gods of this world (lying, stealing, immorality, materialism) and to pursue righteousness. Each one has to decide for himself whom he will serve. Now! "This day," it says. A congregational hymn in French. 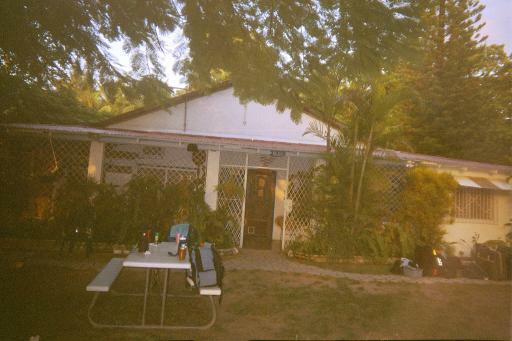 "Moi and me maison - Me and my house will serve the Lord." Almost everyone in the room singing, especially in the chorus. Smatterings of harmony. An altar call by Pastor Philistin. Translated by Pastor Jean. No music, just encouragement. "Don't be ashamed." No one comes. Samuel prays. Song by the men's group, with mostly young men. Begun with tapping feet and a trumpet-like humming. Melody and a harmony. Story of David and Goliath. Hand and body motions throughout. They stood in a semicircle. Descant solo part at the end by Ezekiel. Continued singing as they exited side. Two songs by the women's group. Mostly adult women. Unison. "Don't be troubled. I am the way. Count on me. I know your needs. Be at peace." They stood like a choir. Second song was supposed to be funny: "I would go to heaven. If I could produce wings, go by plane, or if there was a stairway." Hand motions throughout the crowd enjoyed. Also in unison. Clapping quarter notes. Just one verse, done four times or so. A little speech by Pastor Jean, recounting the week's activities. Exhortation recapping Brian's sermon. Anyone want to come? Translated by Dan. "All that you don't know is bigger than you are and what you know." Antoine - was slow to come up, so they called Adair up instead, by Antoine ran from outside and got there before Adair did. "Coup d'etat," he said, and they all laughed. General thanks. Adair - Antoine is sorry to leave only because he doesn't have a wife waiting for him like I do. Tena - pulled up Anton (rather than Dan) to translate for her, saying "we've become a team." I'm not leaving the same. Haitian/American, there is no difference in Christ. To those not in Christ, God loves you, let this church love you. Accept Him now. Terra - a message from Denise. Ever since last year, she's been preparing for this trip. "I know that her heart is here with you." Amen! A message from Tricia (madame Miguel) and Clifton, and then a thank you from herself. Memories to fill a lifetime. God has given me direction here. Another of our songs: Lord, I Lift Your Name on High. I sang some harmony at the end. Then "Mwen Te Deside". The crowd sang loudly with us. I sang harmony on the "na"s.
A thanks from a church member. Youth song #3 (again with some congregational music while they were travelling). A slower melodic song. At least three part harmony, and maybe four. Standing like a choir. Pastor Jean was translating for the folks sitting near him, but I couldn't hear. Kendall - I had no reason to be nervous. Pray that we will all return. Pastor Jean brings a word from Denise, thanks for the craft crosses, Pastor Jean's books for the men. Lauren - she's already praying that she'll be able to return. Thanks for your hospitality. N. - won't talk long or I'll start to cry. Everything I've seen has been from God. We're leaving, but this is not goodbye, but "I'll see you later." John - thank God with me for our supporters who got us here. Kathy (no voice) - Thank you for the gift of your children. I leave my heart as I've left my voice here. Thanks for your hospitality and for allowing us to teach your children. You are a beautiful people. Billy does a song about arriving in Haiti for the first time. "First look is all it took." Afterward Dan explains the song to them and wraps us his thanks. Pastor Jean thanks everyone for staying and being so patient. Pastor Philistin tells the church how God kept the rain away. Final thanks. God knew about our need and chose us to have a sister church. We are brothers and sisters. Closing congregational song led by Pastor Jean. Tune sounds like "Camptown Races" but it isn't quite. Over at 9:30. Prayer and benediction by Brian. 10:45 - Afterward more cake and Cremas. I had three shots and can't really feel anything so it's got a low, low alcohol content. Hear it's rum and Eagle Brand milk. Now to bed. We leave for Dan's house tomorrow. At the retreat center in Zanglais, in the gazebo last night, Brian asked us what God had shown us. I said he confirmed that I'm not called to missions in a country where English is not their native language. Also how similar the flesh (a.k.a. sinful nature) is in Haitians and Americans. It manifests in different ways because of the culture, but they are the same. Also, Dan exhortations about choosing a spouse with the same ministry fit helped me see that I don't really know what my long-term calling is. So I feel like worrying about a spouse is a bit premature until God and I have sorted that out (assuming He'll tell me). 11:35 - Hanging out in the gazebo chatting, waiting for the trucks and lunch. Heading to the missionary hotel in Port-au-Prince after lunch. Wednesday after breakfast (spaghetti?) we packed up and then they bid us farewell. More on this later. 1:20 - Talking with Dan as a group. A devotional. He's talking about the quality of our relationship with Christ. (prayer, Bible study, etc.) It strikes me that I don't actually consider this mission trip to be as interesting, spiritually, as going a month with consistent, rich devotional time with God. 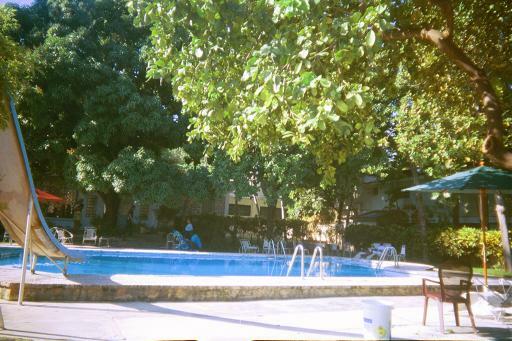 10:10 - Okay, we're in Port-au-Prince, checking into the Villa Ormiso, and have had dinner (steakish meat, rice, and salad), debriefed with Dan, and swam in their pool. Looks like city power is up, since they'd've turned off the generator at 10:00. I'm tired and a little nauseous (I think mostly road trip and partly water in my eyes). Okay, yesterday the farewell consisted of us standing in a big circle, a prayer or two and a benediction, them giving us and Brian a bouquet, and us driving off. Roads were still quite passable. Kendall and I sat in the front of the Prado with Billy driving, and after a few hours and a 45 minutes stop to remove the rear differential and thus turn a 4WD truck into front-wheel drive (where we were able to get Coca-Cola in bottles even in a remote village), we arrived at the Missionaries' Compound around 2:30. Immediately had pot pie for lunch and met Dan's and Billy's respective wives and children. (Dawn is sweet and Billy's little girl is cute as can be.) Got a tour of the compound, including the cool three-room schoolhouse for MKs and the embroidery school store, where I bought some coasters. Just kicked around until dinner (I was playing my guitar some until Dan turned on some Musak I couldn't compete with volume-wise), which was huge unpeeled shrimp. I ate lots once Dawn and Terra showed me how to peel them. Rendezvoused with Denise here. She'd scratched her cornea, and had a cool story about a French-speaking doctor from Africa, and another doctor who'd done his pre-med at Texas A&M. A Haitian Aggie! Then off 45 minutes to the retreat center. I rode in front and Kendall rode in the back of the Prado, but she got carsick and threw up when we got there. En route I mostly talked to Jules about similarities in our cultures, and different evangelism methods and the high price of living in the U.S.
Once there we unpacked the trucks and sat for a bit in the gazebo debriefing about what God had shown us. To bed around 11, I think. Woke up a few times in the night with chest and shoulder pain. I thought it might be angina, but I'm having it again as I write this. John suggests heartburn. Slept until after seven. Showered (first bath since Wednesday noonish). Dan showed up noonish, but they'd forgotten the trunks and Jules (and Adair?) went back to get them. Meanwhile Dan did a little summary devotional. And earlier in the morning Brian had us in a constructive criticism session. 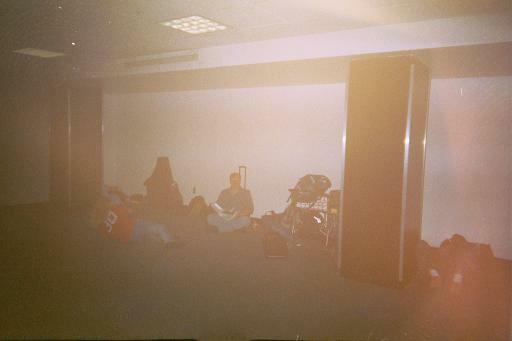 Mostly none of us liked sleeping in the airport. 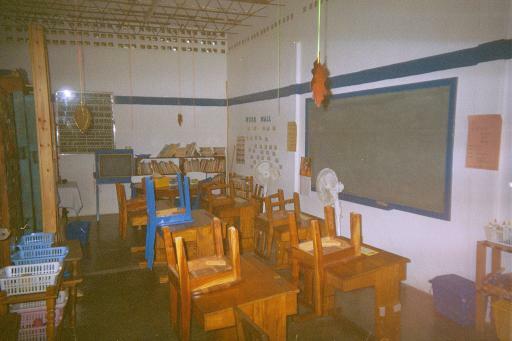 We were dissatisfied with RMI's materials and training and many wanted more one-on-one time in the village. I didn't like how we distracted in the open air service. Had lunch noonish (this excellent cornmeal, corn, and ground beef casserole). Left maybe 1:30. Traffic was bad in places driving to Port-au-Prince, and we had a cool potty break where most of the guys peed out in front of this gas station (the "Station of the Immaculate Conception", believe it or not) in some "stalls". 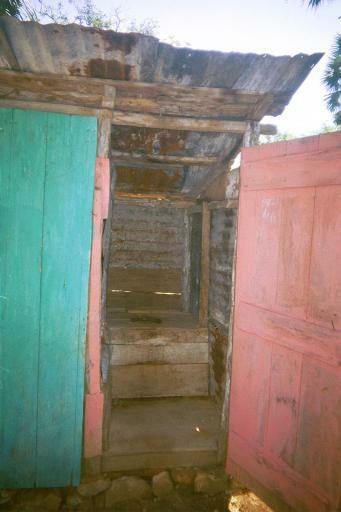 You haven't experienced Haiti until you've urinated in public. Otherwise the drive was uneventful, and we got to the hotel around 6:15, unpacked the vehicles, and went straight to dinner, already in progress. Plan for tomorrow: breakfast at 7:30, the we load up and head to the airport. Supposed to be in Austin just before 11:00 P.M. Sitting in Port-au-Prince airport in the waiting area. We board in about half an hour. Breakfast was oatmeal and toast, and we loaded up and left for the airport. Traffic was pretty easy since it's All Saints Day. Got our bags all checked without too much difficulty and bid farewell to Dan and Billy. Jules is here, as he's flying to New York for some family business. Had a cold shower this morning. I feel maybe a bit ill. Hoping for no diarrhea. All just sitting around talking. 12:20 A.M. Waiting in the Miami airport we had a bit of tension. We're all pretty tired and maybe tired of seeing each other. 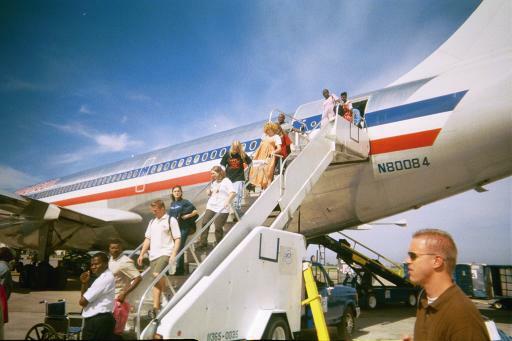 Everybody talked about it, though, there and during the Miami-Dallas leg, and it was dealt with by the time we got to Dallas. Which is good because the flight times were so close together we really had to truck to get there on time. And to add to the stress that last day, when we got back to Austin, Dustin wasn't there to pick up Denise and Terra, and their home phone was disconnected. So John took them home (as well as me) and then they drove back up to the airport to look for Dustin and Mike. I got in around 10:40. Cats are fine. Yea, Kristin! Checked my email, voice messages, and updated the web page. To sleep. Oh, and Crazy Glue spilled inside my carry-on. Lost of bit of the cover of my Bible getting everything out. Ouch.